HBO’s Game of Thrones season seven episode six picks up with the unlikely group of allies on the hunt to retrieve a White Walker beyond the Wall. Tormund (Kristofer Hivju) is happy to be back in the snow, saying that Winterfell smelled like pig sh*t in comparison. Gendry (Joe Dempsie) has never seen the snow and is a bit freaked out by this icy land. As they walk, Jon Snow (Kit Harington) and Tormund discuss Daenerys and how she wants him to bend the knee, and Tormund reminds Jon how many people died for Mance Ryder because he wouldn’t swallow his pride and bend the knee. Gendry is still mad at the Brotherhood for selling him to the Red Witch, and he tells them about being stripped naked and having leeches placed on him. The Hound (Rory McCann) advises him to stop whinging (complaining) because he’s still alive. Next it’s Jon Snow and Jorah Mormont’s turn for a brief heart-to-heart. They discuss Lord Commander Mormont and Jon’s assures Jorah his father’s death was avenged. Jon Snow recalls that his own father was the most honorable man he knew and he died on the executioner’s block. Jorah (Iain Glen) reminds Jon that Ned Stark wanted to execute him, and Jon’s happy his father didn’t catch Jorah and fulfill the death sentence. Jon then turns over Longclaw, the sword given to him by the Lord Commander, believing it rightfully belongs to Jorah. But, Jorah thinks since he broke his father’s heart by bringing shame on the Mormonts, he doesn’t deserve the sword. He returns it to Jon Snow since the Lord Commander wanted him to have it. Back at Winterfell, Arya (Maisie Williams) and Sansa (Sophie Turner) have a quiet talk about their father and Arya recalls him watching the boys shoot arrows at each other. Arya picked up a bow left behind and repeatedly shot the same arrow until she hit the target. When she finally hit the bullseye, she heard her father clap. At that moment she realized that although the rules forbade it, she was doing what she was meant to be doing and her father knew it. Arya surprises Sansa by insisting their father was killed by the Lannisters with Sansa’s help. “What? !” replies Sansa as Arya hands her the note telling her family to bend the knee to King Joffrey. Arya recites what it said, reminding Sansa that she wrote their father committed treason and conspired against “her beloved” Joffrey. In the note, Sansa begged their brother Robb to come to King’s Landing and swear loyalty. Sansa, now angry, tells Arya she should be thanking her for saving Winterfell. Arya reveals she was training at the time, and Sansa says she was suffering unimaginable things while Arya was “training.” Sansa wants to know what Arya plans to do with the note, and Arya says she hasn’t decided. Arya realizes Sansa’s scared what would happen if its contents got out. Arya quickly connects the dots and understands Sansa’s fearful of the Northerners turning their back on her and of losing their respect. Sansa tells her little sister this infighting is exactly what Cersei wants them to do. Past the Wall, Jon Snow’s group continues to pick at each other. The Hound tells Tormund he hates gingers, not wildlings, as they get on each other’s nerves. Tormund repeatedly asks The Hound about being burned in a fire, but then stops when he decides The Hound has sad eyes. Tormund changes the subject and talks about the woman he has waiting for him at Winterfell: Brienne of Tarth. Of course, that’s the person who tried to kill The Hound. Tormund wants to make babies with Brienne while The Hound wonders how Tormund has managed to live this long. “I’m good at killing people,” replies Tormund. Beric Dondarrion (Richard Dormer) asks Jon Snow about being resurrected by the Red Witch. Beric was brought back to life six times by Thoros (Paul Kaye), yet Jon Snow refuses to believe the Lord of Light was responsible for his resurrection. Jon doesn’t understand why you’d serve a god who doesn’t tell you what he wants. Beric admits he’s fighting for life. “Death is the enemy. The first enemy and the last,” explains Beric. “The enemy always wins, but we still need to fight him.” Beric expresses his belief that he and Jon Snow need to defend those who can’t. That’s their purpose. The Hound points out a mountain not far ahead that looks like an arrowhead and says that’s what he saw in the fire. At Dragonstone, Daenerys (Emilia Clarke) tells Tyrion (Peter Dinklage) she likes him because he’s not a hero because heroes do stupid things and die. She lists off Drogo, Jorah, Daario, and Jon Snow, and Tyrion points out they all fell in love with her. That shocks Daenerys because she doesn’t believe Jon Snow loves her. She says he’s too little for her, then apologizes to Tyrion the dwarf for that comment. Daenerys and Tyrion discuss her potential meeting with Cersei, and Tyrion wants her to bring her dragons because he’s sure Cersei’s laying traps. Tyrion advises Daenerys she must inspire fear, but she also has to be different than other Kings and Queens. Jaime promised to keep a grip on the Lannister forces, and Tyrion promised he’d keep her from doing anything impulsive. Tyrion then warns her Cersei will try to provoke her into action and she needs to keep her head about her. He then provokes her anger when he suggests that after she breaks the wheel, they need to make sure it remains broken. Since she can’t have children, they need to figure out who will sit on the Iron Throne after she dies. Daenerys is livid he’s planning for after her death and refuses to discuss succession until she wears the crown. 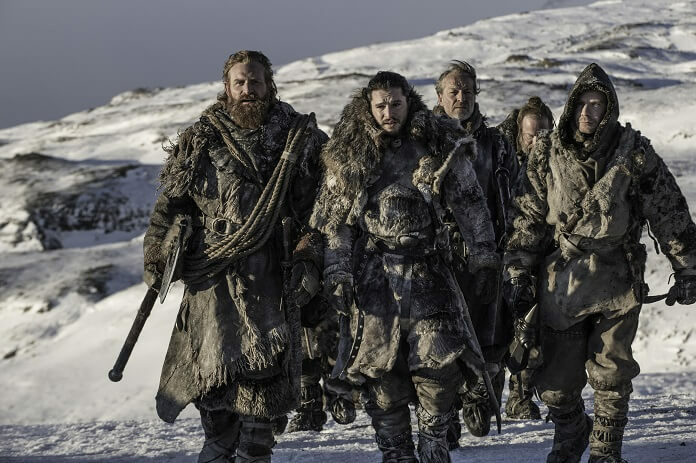 Once more to Jon Snow’s men we go and we find them struggling through a blizzard. Tormund points out a bear up ahead and it looks enormous. It has blue eyes and charges them, and one of the men who walked ahead is immediately attacked and killed. The remaining men form a circle, swords drawn. The snow thickens and once more the polar bear attacks. More men are bitten as Beric’s sword bursts into flames and he stabs the bear. The Hound stands in front of it, frozen in place as the other men attack. (The Hound can’t approach because the bear is on fire.) He watches as men are bitten and Thoros is badly wounded. Beric uses his flaming sword to catharize Thoros’ wound and he’s able to continue. However, they’ve lost one man. Sansa meets in secret with Littlefinger (Aidan Gillen) and he insists he has no idea where Arya got the note. Sansa’s concerned the note will make the Northerners abandon them, if it gets out. Littlefinger says the men right now are ready to trust her, but Sansa knows they’ll desert the Starks if the contents of the note are revealed. She’s worried Arya will release the note because Arya thinks her sister might betray Jon Snow. Littlefinger suggests Lady Brienne can help with the problem since she’s sworn to protect the sisters. If Arya is planning to harm Sansa, she would have to intercede. Out in the snow, Jorah and Thoros talk about Thoros charging through the breach on Pyke years ago. Jorah thought he was incredibly brave, but Thoros says he was just incredibly drunk. Tormund halts the group as they spot a small group of White Walkers. The men follow the group to a river and then attack. Jon Snow slices the leader and the remainder, save one, die. The surviving wight screams as they attempt to bind him, and around them the snowy mountains rumble. They hear the sound of many feet heading their way and Jon Snow quickly sends Gendry back to Eastwatch to dispatch a raven to Daenerys. The group race over a frozen lake as the ice cracks under their feet. They turn to see the army of White Walkers heading their way. Most make it to safety on a small island in the middle of the lake as the ice cracks and swallows many of the White Walkers. The rest of the wights pause and stand in a large circle at the edge of the ice, surrounding the lake. Gendry, hammerless after handing it over to Tormund in order to run faster, sprints to the Wall. Jon Snow’s now slightly smaller group stands on the island in the freezing cold while the White Walkers wait on the lake’s edge. Gendry falls down in exhaustion outside the gate. He’s rescued by Sir Davos (Liam Cunningham) and barely manages to get out that he’s been instructed by Jon Snow to send a raven to Daenerys.